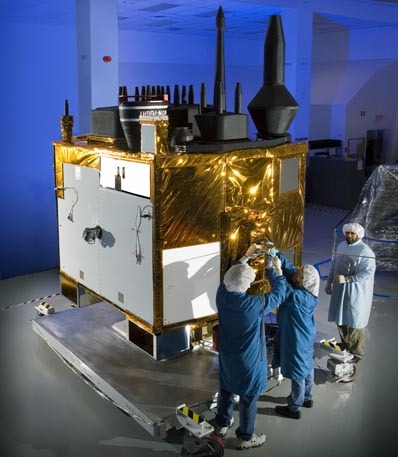 A cadre of military and industry workers at the Cape Canaveral Air Force Station is readying the first-of-its-kind satellite for the Global Positioning System, an advanced bird that will be shipped to the launch pad and bolted atop a Delta 4 rocket next week. Liftoff of the GPS 2F-1 spacecraft from pad 37B is targeted for May 20 during a launch window extending from 11:29 to 11:48 p.m. EDT. "We're getting goose bumps right now. 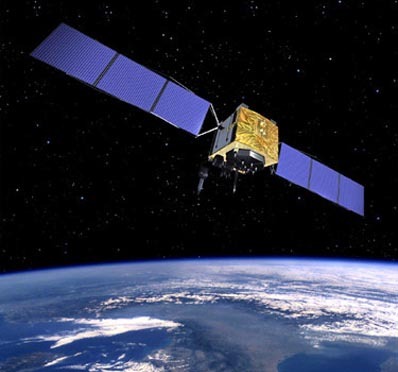 We're very excited," said Harry Brown, the GPS 2F program's chief engineer at satellite-builder Boeing. "There is a pride in working GPS, there is a pride in what we do for the nation and we know this is a national asset." Circling 11,000 miles overhead, the network of GPS satellites emit continuous navigation signals that allow users to find their precise position in latitude, longitude and altitude and determine time. Originally built as a tool for the U.S. military, the utility has spread across the world as an indispensable commercial service. Some 60 satellites have been launched for the system over the past three decades, and now the Air Force is poised to deploy the initial satellite in the Block 2F series that features even higher accuracy, enhanced internal clocks, longer life and reprogrammable onboard processors to evolve with future needs. "All in all, the 2F is improved performance, better anti-jam and it's got additional civil signals to help aviation," said Brown. Choreographing the GPS 2F-1 satellite preparations at the Cape is the 45th Launch Support Squadron, a team of 75 people making certain that a healthy spacecraft gets to orbit safely. "Traditionally, out of the entire lifetime of the satellite, the year leading up to and including launching the satellite is by far the highest risk area," said Capt. Matt Hale, the squadron's GPS section chief. "We fall into the 45th Launch Group. The Launch Group is tasked with providing mission assurance capabilities back to SMC, the Space and Missile Systems Center, in L.A. They have program officers that oversee the factories for the satellites and the factories for the rockets. After they go through their development, they ship them down here and our job is to ensure the final integration activities that happen at the launch site occur correctly." The satellite was flown to Florida inside a C-17 airlifter on February 11 from Boeing's manufacturing facility in El Segundo, California. After arriving at the Skid Strip, it was taken to Area 59 were GPS spacecraft undergo their pre-flight preps. Hale said the work readying the GPS 2F-1 satellite was divided into two phases: an extensive testing period and then the usual launch campaign of activities. "We have what we call a functional test. We do a test in L.A. before we leave the factory that goes through the whole functions of the spacecraft that ensures we have a baseline. When we bring it over to the Cape, we do another set of that test to ensure during transport all of the characteristics stayed the same. Transport is a very stressful environment for a spacecraft, second only to launch," Hale said. Engineers then performed an end-to-end combined systems test between the user equipment that will acquire the navigation signals from the satellite once it gets into space, as well as checking the connectivity from the satellite to the ground control hub that operates the spacecraft in orbit. "We verified the vehicle in terms of the performance and signal characteristics, made sure the user segments would actually lock up and acquire the signal, and verified that the control system had controllability of the satellite," Brown said. "We've had very few issues with the vehicle's performance. It's really operated well." 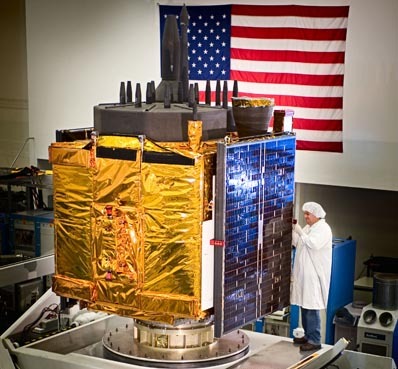 The earlier generations of GPS satellites that launched from the Cape -- Blocks 2, 2A and 2R -- went through Area 59 before reaching Complex 17 where the Delta 2 rockets blasted off. In advance of the 2F era, the satellite accommodations were upgraded with modifications that included stricter cleanliness, security changes, a larger door at entrance of the main bay and installation of a more-precise crane. "Most of the existing capabilities were there. It was just improving the current capabilities to tailor it to the spacecraft a little more," Hale said. Area 59 features two large buildings where GPS 2F-1 has traveled through during the past couple of months en route to the launch pad, Hale said. "We have the NAVSTAR Processing Facility, the NPF, that's where the testing is done and the very first portion of processing is done. Then we move over to the DPF, the DSCS Processing Facility, that's where we do our major processing of the satellite." 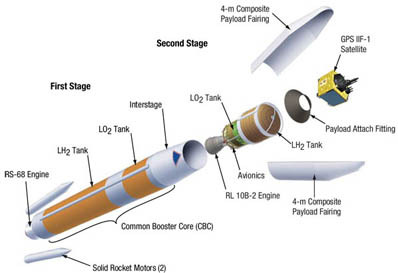 But unlike the previous generations that rode on smaller rockets, the GPS 2F craft will be delivered into orbit atop the Delta 4 and Atlas 5 fleets of boosters in the Air Force's Evolved Expendable Launch Vehicle program. That presents a major change in the way the satellites are launched and affords the ground team a streamlined, if not simpler, task of getting the satellites in flight-ready condition. The Delta 2 rockets, although highly reliable, weren't powerful enough to inject the GPS satellites directly into the orbiting constellation. The three-stage vehicles released the craft into a highly elliptical orbit stretching from 100 miles at its closest point with Earth to some 11,000 miles at its highest point, which is the altitude where the GPS network resides. The newly-launched satellites were themselves fitted with a solid-fuel kick motor that ignited a few days into flight and finished the job of propelling the craft into a circular orbit. United Launch Alliance's powerful Delta 4 and Atlas 5 rockets will haul the GPS 2F satellites directly to their desired destinations, bypassing the circuitous route of the past. So instead of taking days to reach the GPS orbit, the new 2F-1 satellite will get there in three-and-a-half hours on launch night. And without having to deal with that kick stage, the Cape team's work is vastly simplified because it doesn't have put the satellites through stringent spin-balancing and attaching the motor. What's more, the two-piece shroud that serves as the rocket's nose cone will be brought into the cleanroom and placed around the satellite instead of doing that work at the pad like Delta 2 did. The encapsulated GPS 2F-1 payload will be driven to the pad already buttoned up to launch. Before the satellite meets the Delta 4, the past few weeks have involved installing the batteries, loading the maneuvering propellant, working with the adapter hardware needed to mount GPS 2F-1 onto the rocket and putting the final touches on the separation system that will release the craft from the launcher. "It's all tedious work that has to be done with precision," Brown said. Departure from the cleanroom hangar is targeted for next week, when a motorized trailer carries the 3,400-pound satellite up the road to Complex 37. It will be hoisted into the pad tower and bolted atop the rocket's second stage. Interface testing will follow to make sure the electrical connections are good. A rehearsal of the satellite's countdown sequence is planned, too. Boeing is slated to build a dozen Block 2F satellites to replace the current orbiting birds as they age, keeping the navigation signals going strong for years to come. "The importance is sometimes assumed, but it is worth noting. There are both military and civil applications for GPS. It is a very critical national asset in both regards. From the military perspective, it's pretty easy to envision that. We use it to obtain precision navigation and timing," said Hale. "I think sometimes what people don't understand are the civil applications. One that I like to highlight that a lot of people don't realize is the global economy is completely underpinned by the timing signals that the GPS constellation provides. So all bank-to-bank transactions or your ATM transactions have a GPS time tag on them that allows our economy to operate." The Air Force could launch the GPS 2F-2 satellite as early as November using an Atlas 5 rocket from Complex 41. "Sustainment is the primary purpose of our launches. We have a constellation of satellites in orbit, so we are sustaining the existing constellation and incrementally bringing new capabilities on orbit. So the impact having a single 2F on orbit with the 2F-1 you might not see directly a day after the launch, but what you will see is GPS 2F launches will incrementally improve the capabilities to meet the warfighters' needs of tomorrow," Hale said. "There is a lot of importance attached to the GPS constellation and it's ability to be accurate and be available at all times. So our efforts here are in support in that critical national and worldwide asset."